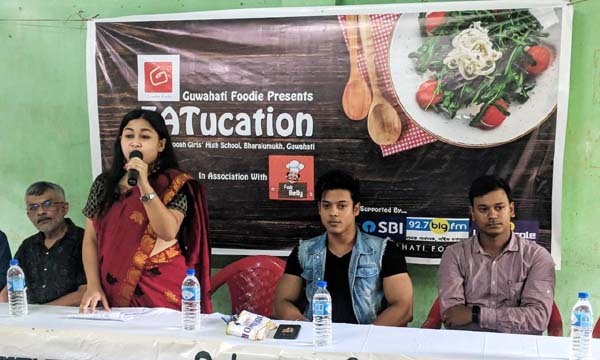 Guwahati Foodie, a Facebook group of more than 93,000 food lovers, on Monday organized a special event for school students to help them understand about various career options, promote health and hygiene and adoption of various soft skills. The Facebook group, founded by Sisir Kumar, organized a day-long programme – EATucation– at Kaliram Barooah Girls’ High School, Bharalumukh in Guwahati to help the students interact with various industry leaders. Speaking on the occasion, founder and admin of Guwahati Foodie, Sisir said that the event is planned to help the young students gain knowledge about the industry and motivation towards sharpening their soft skills.“Through this event, the Guwahati Foodie wants to help the school students interact with industry stalwarts and give them the platform to interact with them. While the school curriculum is very important, attaining soft skills and developing interest to learn from the surroundings has become equally important in today’s competitive world. This event is an endeavour to help the young students know about this sector and help them harness their soft skills,”said Sisir Kumar. Guwahati Foodie’s EATucation, organized in association with Fat Bellyrestaurant, saw participation of various speakers – Dr Apurba Ghosh Chandaon ‘Food and Hygiene’, Gateway Institute of Hotel Management faculty member Nitesh Bhattacharjya on career opportunities in the food sector, Mr India – Model of the World Dipankar Talukdaron soft skills and a speech by manager, SBI West Guwahati Khalil Ikhlaq. The event was supported by State Bank of India, 92.7 Big FMand Life’s Purple. Participating in the event as a mentor and guest speaker, senior public relations professional Nurul Islam Laskarsaid that the Guwahati Foodie initiative will help the students gain knowledge about the indigenous cuisines and give them a platform for various job opportunities.“Guwahati Foodie has done a great job by bringing together all the food lovers, food connoisseurs, and food enthusiasts on one platform. They have also created great awareness among the people because of which people are able to remember food not only when they are hungry, but also when they need to spend good time with friends and relatives, and when they have a celebration at hand. Now, with this innovation project EATucation, Guwahati Foodie will take discussion on food to greater heights. They will create a platform to document indigenous cuisines and inform the youth about job opportunities in the food sector,”he said. Speaking on the occasion, Mr India – Model of the World Dipankar Talukdar, who will leave for Myanmar on August 15 to represent India at the Mister Model of the World pageant, briefed the students about grooming, personality development and the importance of harnessing one’s soft skills.“I am thankful to Guwahati Foodie for giving me this opportunity to speak here. For the students, I want to say that focusing on harnessing your soft skills and being aware of the surroundings will help you in the longer run. The world is getting competitive and you need to have that extra edge to achieve your dream,”he said. Commenting on the initiative, Principal of Kaliram Barooah Girls’ High School, Bharalumukh, Kripanjali Kotoki, said that the event will help the students learn the basics of various sectors.“I am very happy that the younger generation is taking up such initiatives for the betterment of our society. EATucation is an excellent opportunity for the students of our school to interact and gain knowledge from people of various sectors,”she said. Guwahati Foodie is the largest foodie group in Northeast India with 93,000 members.